On August 13, at the Okinawa Prefectural University of Arts in Naha, Professor A. P. Jenkins said there is scope for further research on Bettelheim's activities after he moved to the United States. British missionary and physician Dr. Bernard Bettelheim stayed in the Ryukyu Kingdom for eight years from 1846 before leaving Okinawa with Commodore Perry’s fleet. It is now known that he served as a surgeon during the American Civil War (1861-1865) after going to the United States from Britain. According to a publication released in the United States, Bettelheim was accused of neglect of duty, conduct prejudicial to good order and military discipline, and conduct towards his superiors unbecoming of a gentleman and an officer. The court ordered him to be discharged. Okinawa Prefectural University of Arts professor, A. P. Jenkins, who teaches history and is dealing with the reprint and editing of old documents such as Bettelheim’s diary, has found The Court-Martials of Fifty Union Surgeons written by Thomas P. Lowry and Jack D. Welsh (Mechanicsburg, PA: Stackpole Books, 2000), which covers Bettelheim’s case in 1864. During the Civil War, Bettelheim joined the 106th Regiment of Illinois Infantry as a surgeon with the rank of major. He was accused of neglect of duty for leaving a soldier to die who had been taken to a field hospital. However, in the court-martial proceedings, there was conflicting testimony by witnesses, and the accusation of neglect of duty could not be proven. However, in addition to the charges of neglect of duty, Bettelheim was accused of ordering the private who drove the hospital wagon to go fishing for him and of eating the food for patients without paying for it. The third charge of conduct unbecoming of a gentleman and an officer was that he had repeatedly criticized senior officers in the regiment as drunkards. The court found him guilty on the two charges of eating the patients’ food and of disrespect to his superiors. The court ordered him to be discharged from the Army. Professor Jenkins pointed out that the records of the court-martial indicated that Bettelheim’s quarrelsome nature caused friction within the regiment. The evidence-recorded referred to ill feeling existing between the accusers and Bettelheim. He was a missionary devoted to both preaching Christianity and to his Ryukyuan patients, but he continued to work without obeying requests from the kingdom’s officials for him to leave Ryukyu. He was an autocratic and quarrelsome character. 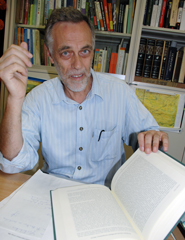 Jenkins said that research on Bettelheim in Ryukyu has become more widespread, including the pioneering work by Yoshihiko Teruya, emeritus professor at the University of the Ryukyus, but that little was known about his activities after he moved to the United States. The professor pays attention to newfound documents in the United States. He indicated that Bettelheim’s character, which did not change in the United States from what it had been in Naha, had also caused trouble in the United States. Jenkins said that Bettelheim clearly spoke out against superiors who did not fit in with own wishes. Dr. Bernard Bettelheim (1811-1870) was a British Protestant missionary and physician. He lived at Gokokuji Temple in Naha from 1846 to 1854 and devoted himself to medical activity and preaching Christianity, winning over a number of believers. He wrote the first translation of the Bible into Okinawan and was the person who introduced Western medicine into Okinawa. He taught Kijin Nakachi, a doctor in Naha, how to prevent smallpox through vaccination.